The Huey is the most recognizable military helicopter of the modern era. It has served in all four branches of the American services and in the armed forces of at least 48 other nations. In early 1955, the US Army awarded Bell Helicopter a contract for a multi-purpose helicopter which could evacuate injured personnel from the front lines, serve as an instrument trainer and as basic utility. Bell Helicopter produced the Model 204 and conducted the first flight on October 22, 1956. After a successful period of testing, production model HU-1As (later redesignated UH-1As) entered service in 1959. 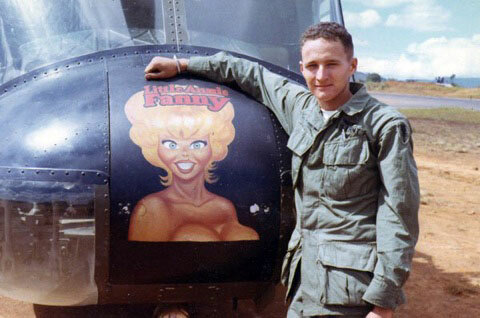 Although the official Army name of the UH-1 is Iroquois it is known as the Huey. The name Huey came from the original Army designation, HU-1, for Helicopter Utility. From that designation the nickname Huey took on a life of its own. Later models actually incorporated the name Huey on the pilot’s foot pedals. The Huey entered combat in Vietnam in 1962, first as a troop transport and medevac helicopter and later as an armed assault helicopter used to protect troop transports. It served throughout the Vietnam War and earned a reputation for being rugged, durable, versatile and able to fly even after receiving substantial damage from enemy fire. The UH-1H on display, (Serial No. 64-13553) was built in 1964 by the Bell Helicopter Co. of Ft. Worth Texas as a UH-1D for the United States Army. This aircraft was assigned to the 117th Aviation Company (later renamed the 117th Assault Helicopter Co.), in Vietnam. On June 16, 1966, while flying an Air/Land assault mission in a hot area on landing zone in support of “Operation Hawthorne”, (one of the most significant and decisive battles fought in Vietnam), 64-13553 was hit 5 times by enemy fire wounding one on board and causing damage to the bottom of the fuselage, hydraulic, and flight control systems. In November 1967 it was transported to the Army Aeronautical Depot Maintenance Center (ARADMAC) in Corpus Christi Texas for overhaul and repair. 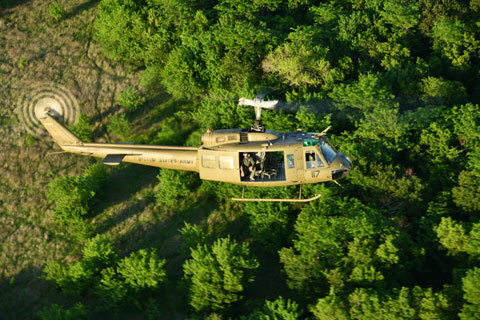 In April 1968 it was sent to Bell Helicopter in Fort Worth for upgrade to “H” model. In April 1968, 64-13553 was transferred to the 355th Aviation Company at Fort Sill, north of Lawton, Oklahoma. 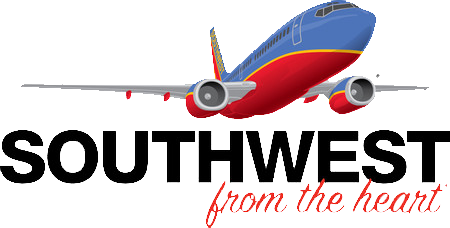 In July it was transferred to Fort Belvoir, Virginia and again transferred to Army Flight Training Center at Fort Stewart, Georgia. The Cavanaugh Flight Museum acquired 64-13553 in 2018. It is painted in the colors and markings it wore when in service with the 117th Aviation Company during the Vietnam War. ENGINE Lycoming T53-L-13 turboshaft developing 1,400 shaft h.p.